Embracing sleep as a major necessity for healthier living is something that most people need to do. This underrated part of everyday life is continuously being neglected, when science dictates that it is one of the most critical aspects of a healthier being. The first proof that sleep is necessary is the fact that we ought to be spending a third of our lifetime in slumber. With the kind of impact sleep in our physical health, rethinking sleeping habits should be in order, as well as creating a better environment that promotes adequate rest. In fact, your bed and bedding choice should be among the first things you should think about when trying to achieve healthier sleep. Organic duvets, comforters, mattresses, and mattress protectors are the smart choice when it comes to building a restful environment that is not only comfortable and safe, but also promotes good health. If you still haven’t heard about the many hazards of traditional mattresses and beddings, perhaps it’s time to get more informed. 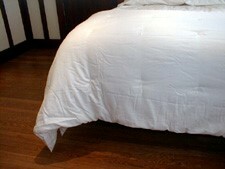 An organic cotton duvet, for instance, is a far healthier choice than cheap, synthetic duvet. This is because organic beddings are made using safe processes that don’t leave the end product soaked in toxic chemicals that off-gas over time. Cheaper alternatives that have been put together using haphazard processes may cost you your health in the long run. This is why it is far better sleeping on a material that is free from toxic compounds that are linked to different health problems. With an organic duvet, mattresses, and beddings, you get the quality sleep your body deserves. Proper sleep leads to an overall healthier life as it helps protect not only your physical but also your mental health, which in turn leads to higher quality of life that is free from common health issues brought about by unhealthy sleeping habits.